This is just a fun bonus to make up for how long some of the other mashups have taken. It's much cartoonier than its counterparts, and therefore was much easier to produce. 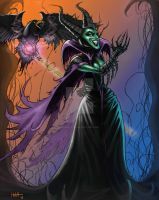 Do The Evil Queen Grimhilde A.K.A. Hildy As Ultron Next. What a crazy mixture! Great idea and well done! She didn't changed that much. I wanted to comment "make a deadpool", but then I thought it'll be boring and will get someone like Brave.